Approved to be a recruiter? 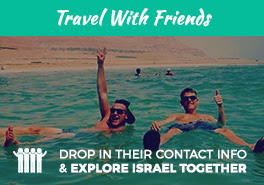 Sign up here and make sure your friends, family, and those in your network register for their Birthright Israel: Shorashim trip! Anyone you recruit to sign up for Birthright Israel must be eligible for the program to the best of their knowledge, complete the entire Birthright Israel application, and submit their deposit to be included in your total number of recruits. Once registrants complete their applications, they'll be able to choose you as their recruiter in the Date & Friendship Request section of their Shorashim secondary application. You will receive credit for each registrant who submits their refundable deposit before registration closes & travels. It is in the applicants best interest to submit their deposit as soon as possible once registration opens. We highly recommend applying in full within the first week, if not the first day, in addition to taking advantage of early bird registration by signing up for early access! Credit is awarded only for eligible applicants who register for Birthright Israel: Shorashim experiences. Generally speaking, applicants are eligible if they are ages 18-26, Jewish, & have not been to Israel on a peer program since high school. For detailed rules on eligibility, please click here. As a recruiter, you must only recruit for Birthright Israel: Shorashim trips & not work with another provider in the same regard. Each registrant can designate only one recruiter. Once a registrant is recruited, their registration only counts towards rewards during the season that the applicant travels. No coercion, pressure sales, or misrepresenting the program. Our recruiters should represent Birthright Israel:Shorashim trips as the high-caliber program that it is. Recruitment is for the purpose of spreading the word about the Birthright Israel: Shorashim program & for competition within the Ambassador program itself, & there is no other incentive attached. In particular, Shorashim does not necessarily award staff positions to its recruiters. If you feel that you are qualified to be a staff person, you may contact us Joel Pachefsky at joel@shorashim.org. You are not able to receive credit for signing up yourself. Referral to the program is not a guarantee of acceptance. We do our best to accept applicants - particularly those sent to us by our recruiting team - on the dates that they request. The best thing that an applicant can do to improve his or her chances of acceptance on our program is to submit the deposit & complete all steps of the application process as soon as possible. Shorashim reserves the right to cancel participation of any recruiter who does not abide by the rules of the program. Payment will be paid in Amazon or Target gift cards, or a donation in your name to the charity of your choice. If you earn more than $500 in any given season, you have the option to be paid out via check as well. In order to get paid, you must recruit at least three applicants who travel.